Most professional chefs prefer to good on gas stovetops. Of course, to get the best results, you need the best pans for gas stoves. We’ve researched some of the best cookware by looking at everything from the best-selling to the most popular sets out there. Our list of the top ten products is here to help you find the best cookware for gas stoves for your home. But first, let’s take a look at the features to keep in mind. 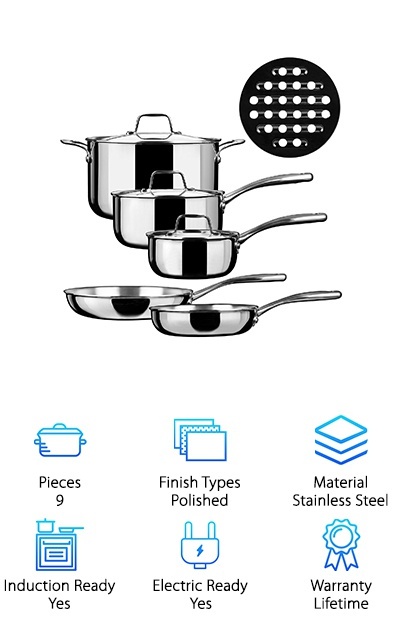 Pieces - Do you want a cookware set that gives you a wide range of frypans, stock pots, and casserole dishes? Or do you want something that gives you only the most important, basic pieces? You’ll find both here! Finish Types - There are a few options when it comes to finishes. Nonstick is generally easier to clean but you should avoid metal utensils and the dishwasher. Metal finishes are a little more forgiving about these things. Material - As you’ll see, aluminum is an important component in most cookware. It conducts heat evenly, which is important when cooking. Even most stainless steel cookware has an aluminum component so you don’t get any hot spots. Induction Ready - In a nutshell, induction cooking depends on magnetic fields. In order for gas cookware to be induction ready, it has to be made of a magnetized metal. Stainless steel is a good example. Pure aluminum cookware is not. Electric Ready - Nearly any cookware is okay to use on an electric stove. That said, consider this: if you have a flat electric range that doesn’t have coils, look for cookware with flat bottoms for more even heating. Warranty - It’s always important to know what the warranty covers. For example, a lifetime warranty doesn’t mean that you will get replacement cookware no matter what happens. Read the fine print so you know what’s covered and, more importantly, what isn’t. The best pots and pans for gas stoves will make cooking more fun and can even make your food taste better. And isn’t good tasting food the whole point? That’s why we did our research and found the best products to consider. Now that you know more about what features matter most, let’s take a look at the best products available. In a rush? A great place to start is with our top and budget picks. Now, let’s get cooking! These stainless steel pots and pans are perfect for a gas stove. And check this out: they’ll work with electric and gas stoves, too. This set gives you a little bit more than just the basics. 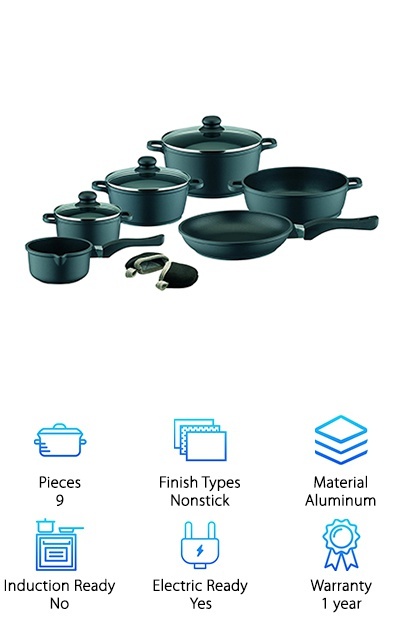 You get large and small frypans with lids, large and small sauce pans with lids, a casserole pot with lid, a stock pot with lid, a sauté pan with lid, a boiler basket, a steam basket, plus 3 utensils. The aluminum bottoms offer good, even heat conduction so there are no hotspots. What does that mean? You can heat your food evenly with less chance of burning. Cleanup is easy because they’re dishwasher friendly. You can also put them in the oven up to 500 degrees and even pop them in the freezer for food storage. 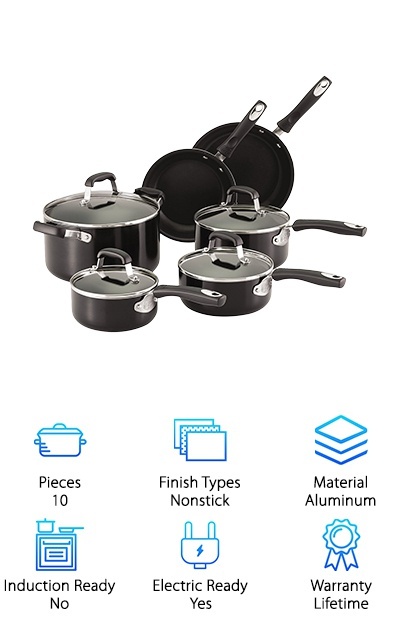 For a simple set of the best cookware for gas stove cooking, check out our budget pick: Cook N Home’s Ceramic Coating set. It’s safe to say they’re both fun and functional. What do we mean? Well, they’re made of aluminum so they have excellent heat distribution and cook your food evenly. The Bakelite handles are durable, easy to handle, and give this set a distinctive look. You know what else makes them stand out? The bright, bold colors. These are not boring pots and pans. You get a salmon colored sauce pan with lid, a teal blue casserole dish with lid, and a dayglow yellow sauté pan with lid. They’re a fun addition to any kitchen but they’re practical, too. Why? They’re dishwasher safe so cleanup is a breeze. Guy Fieri’s Cookware Set not only looks really cool, it’s also some of the best pots and pans for gas stoves. The aluminum construction makes them a great choice because of how well the metal conducts heat. What do we mean? It heats up very evenly so there are no hotspots which means less chance of burning your food. Plus, they’re oven safe up to 350 degrees. Cleanup is easy, too, thanks to the nonstick coating. You can put them in the dishwasher but hand washing is recommended if you want the finish to last as long as possible. This is a nice sized set. It comes with a large and small frying pan, a stock pot with lid, large and small sauce pans with lids, and a deep sauté pan with lid. ELO makes some of the best pots for gas stoves in the world. Here’s how we know: they’re made by a German company that’s been in business for more than 80 years! 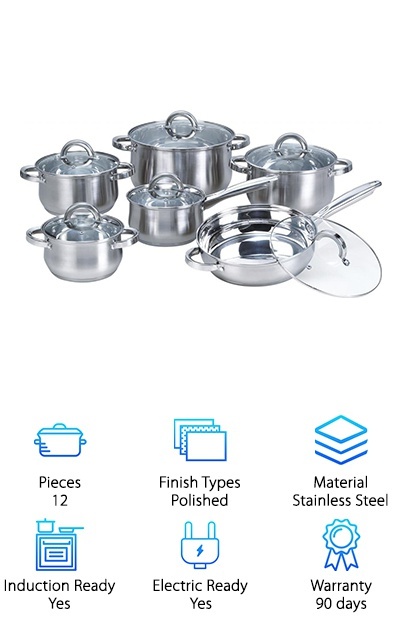 This cookware set is made of cast aluminum and has a durable nonstick coating. Aluminum? Again? Yes! Aluminum is the ideal metal for cookware because of how it conducts heat. That’s why most of the top rated brands use it! The lids have insulated ergonomic handles and a set of oven mitts are included. They’re nonstick so cleanup is already going to be easy, but they’re dishwasher safe, too. It’s almost like they clean themselves. 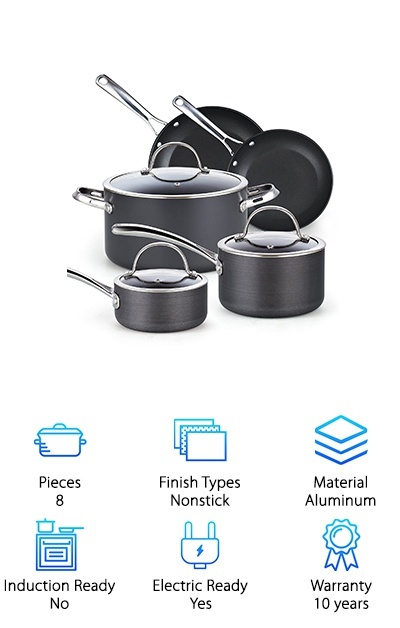 In this kit, you get 3 different size casserole pots with lids, and a sauce pan with pouring spout, a serving pot, and a frying pan. 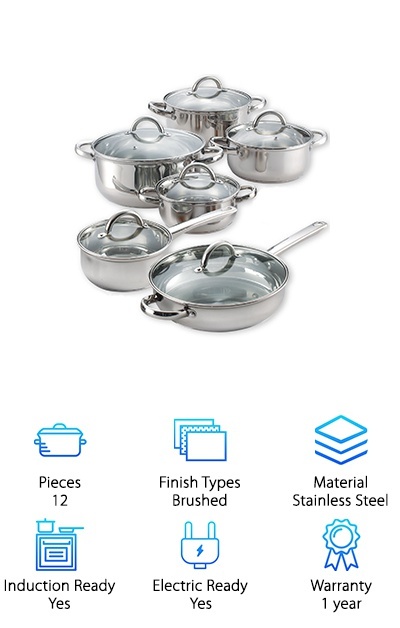 This set from Duxtop is the perfect size and has all of the essentials: large and small frypans, large and small sauce pans with lids, and a large saucepot with lid. They’re made of whole-clad triple layered stainless steel with an aluminum core. Aluminum is a great metal for heat conduction. What does that mean? Heat spreads evenly so the whole cooking surface (including the sides!) maintains the same temperature. You’ll get more even cooking this way with less chance of burning your food. This cookware can tolerate up to 500 degrees in the oven. The stainless steel handles give this cookware a bit of an industrial look. Another nice feature is the drip-free pouring rims to help you cut down on mess. Oh, and guess what else will help with messes. They’re dishwasher safe. When a brand has been around as long as ELO, you know you’re getting some good stuff. After 80 years of kitchen innovations, it’s safe to say that they know what they’re doing in the kitchen. These stainless steel pans have an encapsulated bottom that helps with heat distribution. This means even heating What does that me? Even cooking for better food. They’re great for gas stoves but will work with electric and induction cooktops, too. Included with this set is 4 different sized casserole pots with lids and a 6.5” saucepan with lid. The handles are ergonomically designed for comfort while you’re cooking. They also give this cookware a cool modern look because they’re oversized and streamlined. Cleanup is easy, too, since you can just pop them in the dishwasher when you’re done cooking. If you’re looking for the best pots and pans for gas stove cooking, this Chef’s Star set gives you just about anything you could need. You get large and small saucepans with lids, a casserole pan with lid, stock pot with lid, sauté pan with helper and lid, a boiler and a steamer basket, plus a set of 3 kitchen tools. The handles have an anti-slip finish and are ergonomically designed for comfort. They can go in the oven, too, at up to 550 degrees. Get this - they’re also great to use in the freezer for food storage. This is a great looking set. The brushed stainless steel inside and out looks like something that would be in a chef’s kitchen. One more thing - cleanup’s a cinch because they’re machine washable. 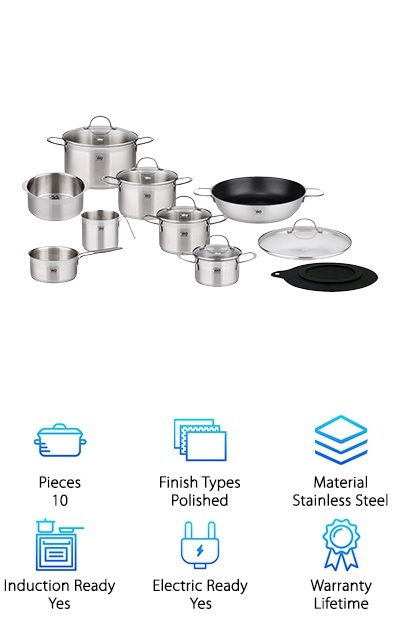 The Cook N Home Stainless Steel set gives you a lot of equipment: a sauce pan with lid, a large and small casserole dish with lids, a stock pot with lid, and a frypan with lid. Its mirrored, polished stainless steel finish looks amazing. For even heating, the bottom is encapsulated with - you guessed it - aluminum. The handles are riveted to the pots and pans for stability and add to the look of the set. They’re oversized and give this cookware a streamlined, modern look. And that’s not all. Cleanup is easy, too, because they’re dishwasher safe. They’re even oven safe up to 500 degrees. One more thing: if storage is an issue for you, this set stacks together nicely and will take up less room when not being used on the stove. The nonstick surface on this set is exceptional. And that’s good news because it means you don’t need to use as much oil and can cook a little healthier. Plus, it works so well that cleaning up is as easy as wiping it off with a cloth! You don’t really need to use any harsh chemicals or cleaners. While they are dishwasher safe, the nonstick coating will last longer with hand washing. The surface is anodized so it’s more durable and harder than other cookware. Guess what else? You won’t get hot spots with this cookware because - surprise! - it has a heavy gauge aluminum core. 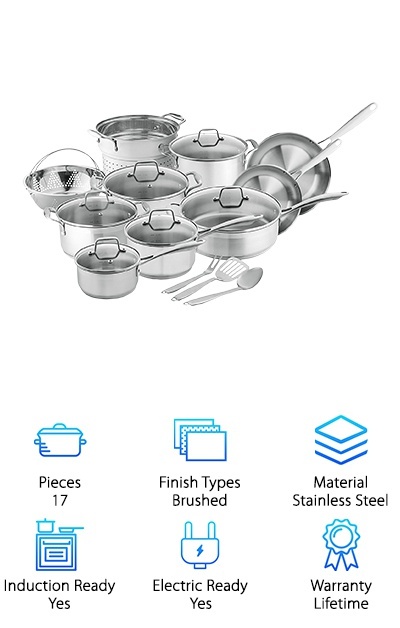 In this set, you get large and small sauce pans with lids, a stockpot with lid, and large and small sauté pans with lids. One more thing: they’re oven safe up to 500 degrees. 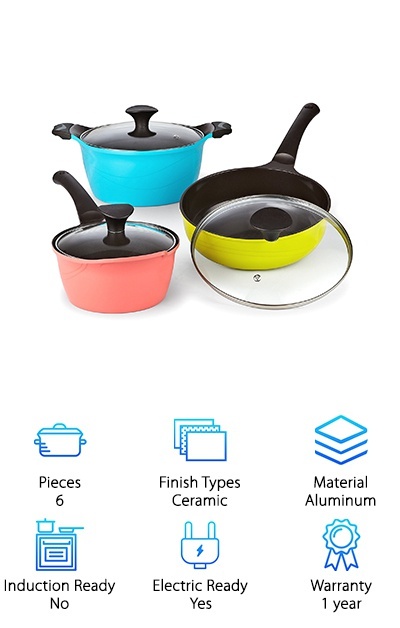 This cookware has an interesting look to it. Thanks to the brushed stainless steel surface, curved lines, and large circular handles, it will really stand out in your kitchen. Of course, it’s amazing to cook with, too. Heim uses a 3-layer technology that has a special thermal bottom that heats up quickly and retains heat for more even cooking. The polished inside surfaces release food easily for less stuck on messes. 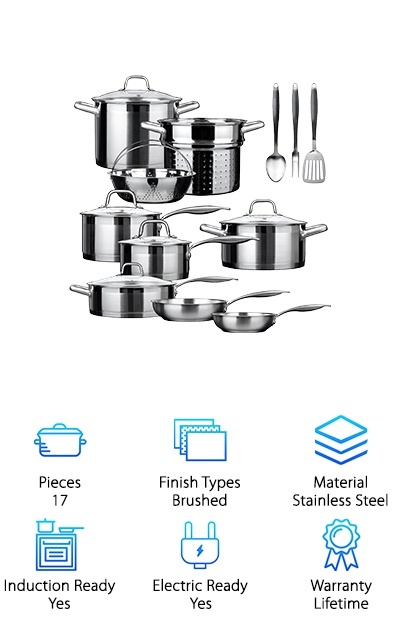 In this set, you get a large frypan with lid, a saucepan with lid, and 4 different size casserole pots with lids. You really get everything you need to cook whatever recipe you’re craving. And check this out: the rims are tapered for mess free pouring. In fact, cleanup in general is easy because this cookware is dishwasher safe.